Chicken eggs are parve (neither milk nor meat) though unlaid eggs, being part of the chicken, are meat. (http://judaism.about.com/library/3_askrabbi_o/bl_simmons_eggs.htm). 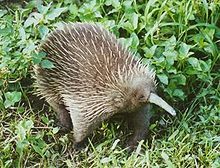 But how about monotremes (duck-billed platypus and echidna or spiny anteater, egg-laying mammals)? See Wikipedia (http://en.wikipedia.org/wiki/Monotreme) for examples. Mexicans are the punishment for abortion?